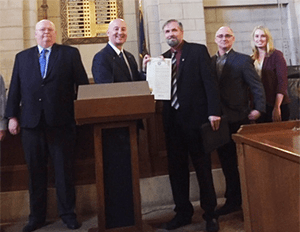 Nebraska Governor Pete Ricketts (second from left) displays his Grain Safety Stand-Up Proclamation with representatives from OSHA, the National Safety Council, and the Nebraska Grain and Feed Association. Governors Laura Kelly of Kansas, John Bel Edwards of Louisiana, Michael L. Parson of Missouri, and Pete Ricketts of Nebraska signed proclamations recognizing March 25-29 as Stand-Up for Grain Safety Week. The purpose of the event is to increase awareness of grain industry hazards, including bin entry, machine guarding, falls, heat, combustible dust, and struck-by. The governors recognized the efforts of participating organizations to ensure worker safety with proper training, supervision, and equipment. More information is on the Stand-Up for Grain Safety website. Safety-Reports was founded in November 2011 by Chet Slump and Steve Polich, CSP. At the time, Chet owned his own company that designed and built mobile apps for the Ag Industry and Steve worked in the insurance industry as a Loss Control Consultant. One morning in the Spring of 2011, Steve and Chet met at a local coffee house in Omaha, NE and during the course of their discussions, Steve happened to mention what a long week it was traveling across Nebraska doing safety inspections and then working late into the night typing up his reports. Steve, half-jokingly said, “wouldn’t it be nice if there was an app for that”. Chet, somewhat surprised that there wasn’t, said “draw it up and let’s build it”. And that’s how Safety-Reports came to be. With Chet’s 15+ years’ experience building apps and Steve’s knowledge accumulated over 12 years conducting safety audits for various industry groups, the two rolled up their sleeves and started building an inspection app that’s not only comprehensive and simple to use, but also affordable. By the time we were done, we built a “custom app solution” with an “off-the-shelf” price tag. that’s appealing to many industry groups. Over the past few years we’ve grown our company into one of the industry leaders in the inspection app market, in large part due to word-of-mouth referrals. We’ve also figured out that the best way to retain business is by providing service and support that is second to none! If you’re looking for a mobile inspection app, you’ll find that with Safety-Reports, you’re not just subscribing to a solution, but you’re also partnering with a company that will put your needs first! Whether you’re big or small, we’ll treat you like you’re our best customer, because that’s who you are to us! 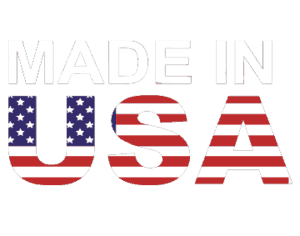 We hope you’ll give us the opportunity to earn your business and show that you truly are our best customer!